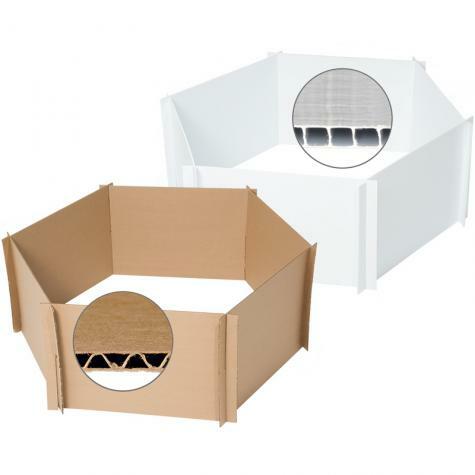 Disposable & Reusable Brooder Panels. Insets are showing the internal view. 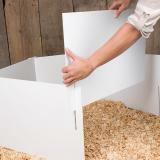 Our chicken brooder panels will make any size brooder you prefer. 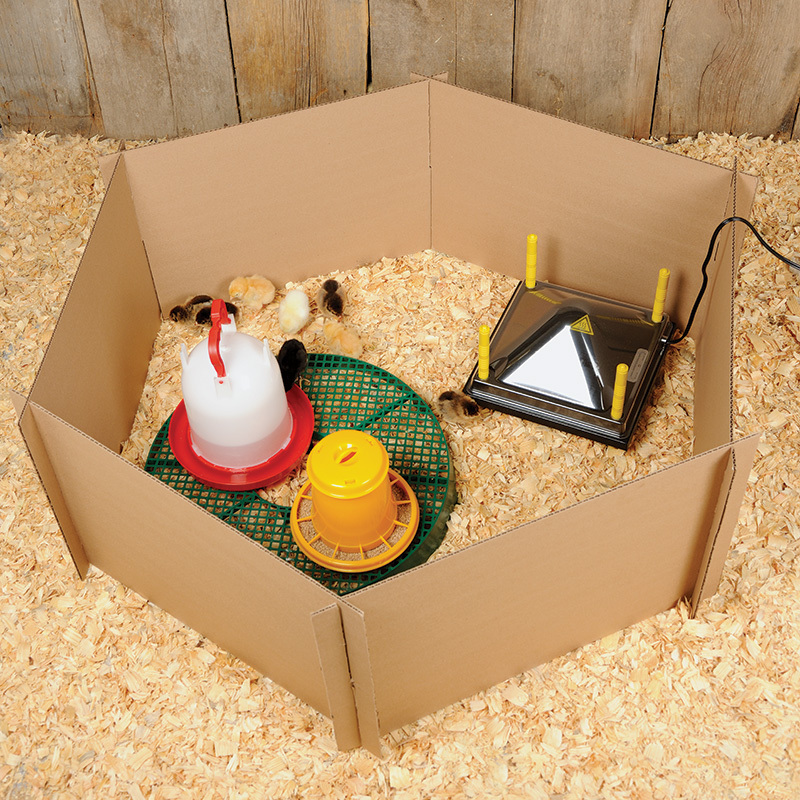 Can also be used as a brooder for other poultry including poults, duckling and goslings. 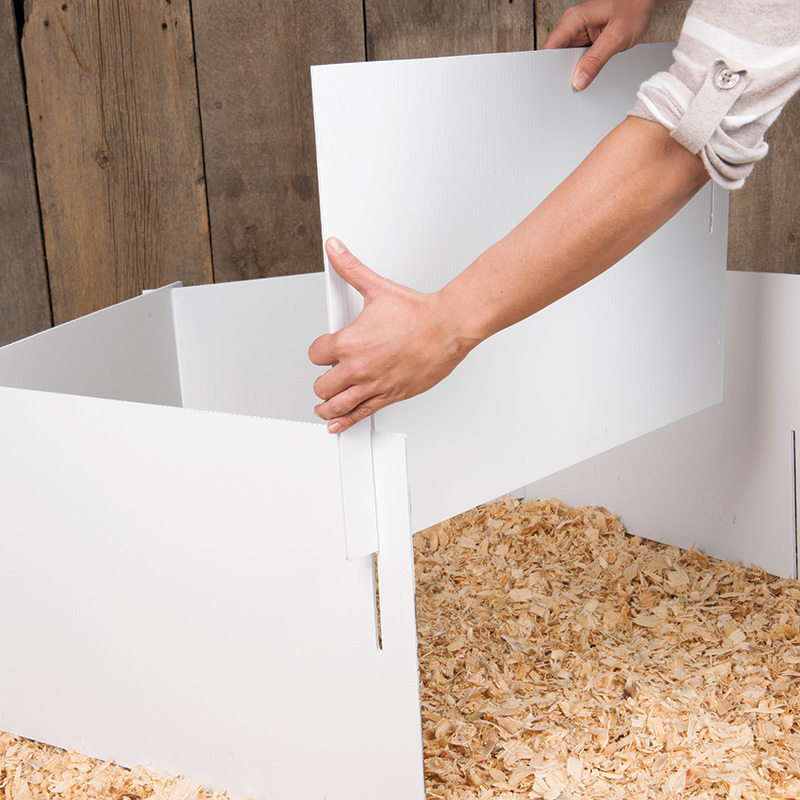 Build a safe, secure chick brooder using modular brooder panels. Quick to assemble with disposable and reusable options. Our brooder panels will make any size brooder you prefer. We allow 0.5 sq ft of space per day-old chick. Each panel is 16" x 25". The completed size varies according to the number of panels used. Disposable panels and bedding make excellent mulch for the garden. Reuseable panels can be cleaned and used again next year. Easy to assemble, just interlock the connector slots. Six panels make a 37" diameter brooder. Seven panels make a 50" diameter brooder. If you are going to place the Heat Lamp Stand in the brooder, you will need 5 panels total in order for the stand to fit inside the brooder. If the brooder is comprised of 4 panels, two of the stand's legs can fit in the brooder with two on the outside of the brooder. 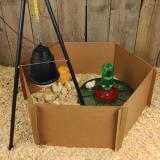 A compostable cardboard tray that feeds young chicks that are learning to eat and scratch. 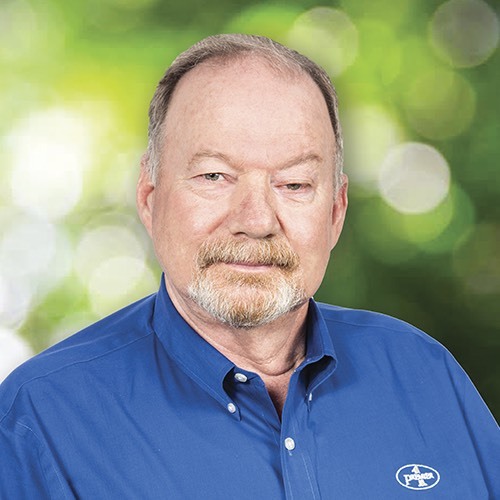 Powerful granules absorb moisture and ammonia odors, creating a healthier environment in your coop. Number of reviews: 22 customers reviewed this product. Recommended: 18 out of 22 said they would recommend this product to a friend. The panels are not tall enough! My chicks, at just 10 days of age, were easily able to jump up to the top edge of the panels. Putting chicken wire across the top was a bother, for my frequent access to the chicks, bedding, and feed/waterers, so I cut panels of corrugated cardboard and taped them as vertical extensions on the panels, which seems to be discouraging escape attempts. Also a problem with these panels? Some of the reusable panels had ragged plastic at the edges. You definitely want to trim those "threads" off because my 3-day-olds were already picking at those ragged threads and I feared they'd break them off eventually and swallow a fatal plastic piece. Otherwise, I'm finding these panels an improvement over the large horse troughs I've used as my brooders in the past. The panels allow for lots more room for the chicks to run around! Also, the panels work very well with the Premier 1 tripod. I have 12 chicks and ordered seven to begin with. It wasn’t enough once you put in the heater, water, and food (ie free shipping due to $ amount). Then I ordered four more and paid more for the shipping then I did for the panels. I also learned that it works better to make a rectangle than an octagon, as you have to put the chicken wire over the top., so strips are easier. 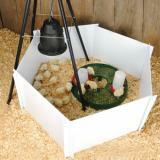 When I had it set up as an octagon one area sagged and 1 chick got out through the bottom and died. I also wish these were a little taller. Easy set up and easy to clean for multiple use. We are using the plastic panels for the first time this hatching cycle. Using it for both turkeys and chickens. We do not use litter. Instead, we use heavy kraft paper as a nonslip flooring material. Our brooder coop is well insulated and a couple 200 watt heat lamps is sufficient. We have four pens set-up in the brooder building and so far, are satisfied with the plastic panels. Probably lay some lightweight chicken wire over the tops when they start flying over. Pros: easy to assemble/disassemble and store, sturdy. Cons: height OK for inactive Cornish cross broiler chicks up to 2 weeks old; too short for more active 'real' chicks like layers (e.g. Rhode Island reds, Easter eggers) and turkey poults after about 10 days. Major issue is if you build a pen big enough for 20-30 chicks (15-17 panels) the panels bottom edge sags outward after about 1 week to the point of litter leaving the pen under the panel's bottom edge (photos sent in to Premier1). To resolve this required encircling pen about 2-3" up from bottom with a cord, running it behind each panel's slot and then tightening to hold panels in a full upright position. Without this the pen would likely collapse in on itself after a few weeks. If you are going to build a brooder with 10 or more panels and keep chicks in it for several weeks it would be wise to install the bottom cord snugger when the brooder is first set up and before litter and chicks are added.